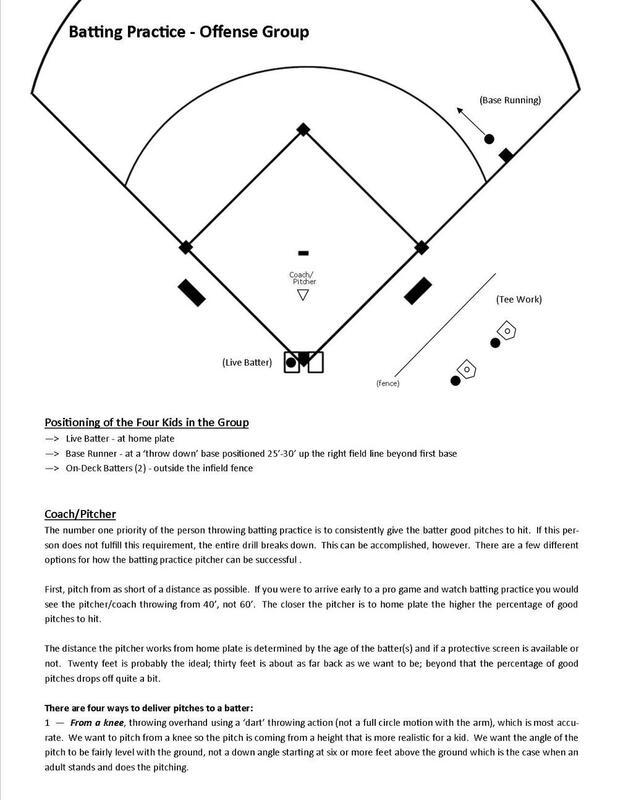 Batting Practice, when structured correctly, is run as a Drill. It is a multiple-activity routine in which each player on the field is active and developing skills at all times. In addition to the player batting live on the field, other players are taking swings off of a tee, working on base running, fielding, pitching, catchers are working on their skills and more kids are getting additional live swings at the Skills Station. The most important aspect of the on-field batting aspect is that the batter is given a high percentage of ‘good pitches to hit’ (by the batting practice pitcher). If we are unable to provide a high percentage of strikes, using a tee for the ‘live’ batter is an acceptable solution. Using a tee is reasonable when we look at the live batter in the context of being just 1 of 12 players in the ‘Drill’. 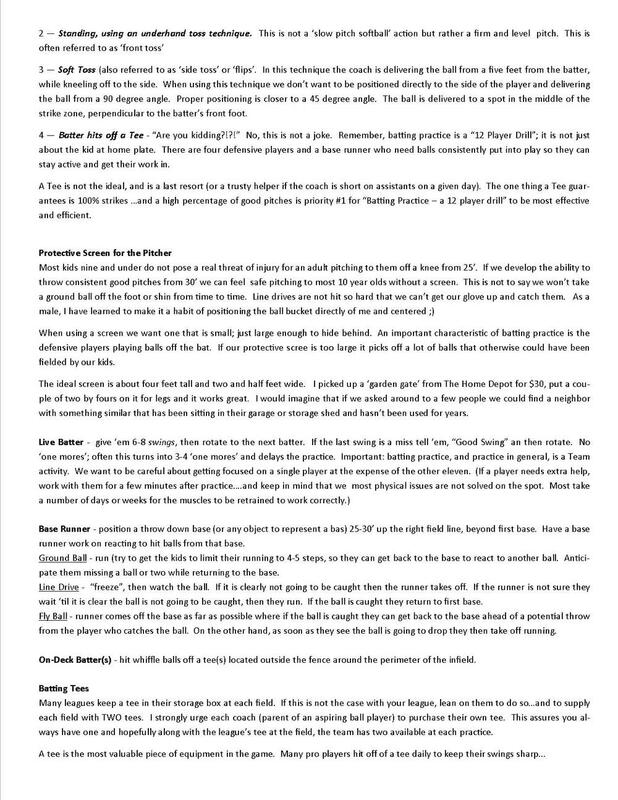 Also recognize that the defensive players and base runners count on the batter getting strikes and putting the ball in play in order for them to get their work in. 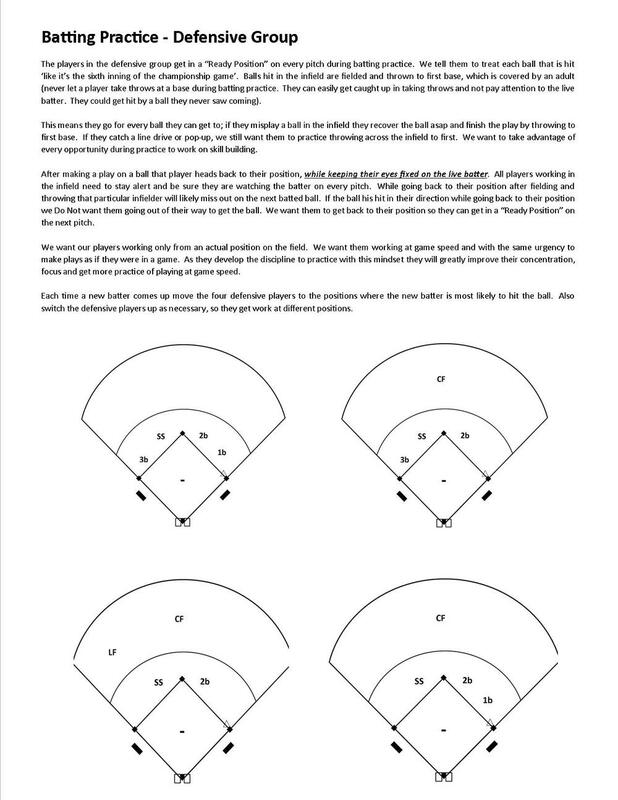 When this drill is run (Batting Practice) efficiently we can get it done in 20-25 minutes. However, it WON'T run well the first time or two ...or three. It will take time for the coaches, players and parent helpers to get a feel for the flow. Plan for 45 minutes the first day. After five or six sessions this activity will get down to around 25-30 minutes. Note: Throwing pitches from full distance is not necessary and in almost every case leads to poorly located pitches. What percentage of good hittable pitches do we throw from full distance? How inactive are our players when we don’t throw good pitches consistently? More reps: It is safe to pitch from a short distance; the shorter the distance the higher percentage of strikes. Easy Pick-up: The balls travel, at most, 50'-60'. Multiple batters can hit simultaneously: These balls have a minimal safety risk so more than one can be flying around at a time. Also, a pitcher can throw to two batters at a time (and after the pitcher gets more experience they can pitch to three and maybe four batters at one time). Wiffle ball batting is a staple for any youth baseball or softball practice that maximizes the skill building of its players in practices. This is an activity performed prior to each practice. We set out objects (cones, t-shirts, bucket lids, etc.) to serve as home plates and set wiffle balls approximately 12'-18' from the home plates for the adult/coach doing the pitching. Early arrivals grab a bat and helmet (for safety in case of getting hit by a bat) and jump in and start batting. Other kids retrieve the batted balls. The adult/coach who is pitching rotates kids in and out of batting every 8-10 swings. This is is also the core activity of the 'Skills Station' portion of 'Batting Practice: A 12-Player Drill'. We do not pitch a whiffle ball while standing. Wiffle balls are thrown from a knee at a distance of 15'-20' from the batter (maybe 25' when throwing to a big 12 year old). The primary reason for throwing from a short distance is our pitching accuracy in increase a great deal. The most important thing for a player working on their swing is to see a high percentage of strikes. We do not want to use a full long circle motion with the arm as if we were actually pitching. The throw, from shorter distances is very similar to throwing a dart. If a little more arm is needed to get the ball to the batter, the elbow and hand can be brought back to the shoulder/ear/head area. Good wiffle ball pitching technique relies a great deal on the wrist snapping through the ball at release. The wrist snap supplies a lot of force and is the key to accuracy. Do not lob the ball and/or throw it in an arc. Often with younger players and players still developing their swinging skills the tendency is to throw the ball slower with a big arc. This type of pitch, in most cases, is more difficult to hit than a ball thrown a bit firmer and more on a line to the strike zone. Note: When pitching to two batters, position them about 10' apart, so they are safe from the swing of the other batter. Position yourself 12'-18'' away, centered between the batters; envision a tall triangle. Whenever there are multiple batters they must always wear a helmet. The helmet is to protect them, not from the ball, but in case they get hit by a bat. NOTE 1: Live batting is not a time for in depth instruction . This is a chance for kids to get reps and to adapt timing to their swing. Instruction is to be limited to the above key points. The points above are also followed when ‘instructing’ the live batter and the batters in the extra hitting group during batting practice. In depth batting instruction is done outside the Team environment, in an organized group situation where the focus of every player is leaning the swing or when working with one or two players and there is time to really work in what is being taught. In a practice where the kids are only working for five or 10 minutes trying to make changes on the fly generally leads more to confusion than improvement. Ideally, some instructional understanding has been established between the coach and batter prior to hitting live pitches. The talk during the live session is limited to quick simple reminders ('Live 5') of fundamental parts of the swing. Note 2: A tee gives the batter a guaranteed good pitch to hit 100% of the time. Getting a good ball to hit as often as possible is the most important factor in developing the swing. Many leagues now keep a tee(s) in each field’s storage bin. Push your league to up the number to two per field. Also purchase your own (that your child can use at home). A good tee can be found for $25. ...7-8 minutes per station. Allow 60-90 seconds for rotation. Eight swings per live batter. No 'one mores', a real time killer. If the last swing is a miss tell them 'good swing', then rotate (they are getting plenty of swings throughout the drill). Note: a big time killer in many activities is deferring to one player at the expense of the other twelve. Practice is a Team (group) activity. Personal work takes place before practice, after practice or at home. Live Batting (1 player) - Coaches throwing consistent strikes is a must. With kids age 9 and under, throw off a knee from approximately 20’ using a ‘Dart’ like arm action. With older kids you likely need protection (use as small of a screen as possible - pick up a garden gate from Home Depot or your neighbor's storage shed (be sure to ask); throw from about 25’-30’. If you have a screen available (the smaller the better...2’w x 4’h) toss firm, level, underhand tosses from a point approximately 15’-20’ in front of home plate. Toss balls from a 45 degree angle (not from the side - 90 degrees), from about 4-5’ away. Use a slight back swing to allow the batter to time their load ("Turn Back"). Toss the ball so it reaches the top of its arc at the intended contact point. This is ‘even with the front foot’ for pitches in the middle of the strike zone. NOTE: always tell the batter where you will locate the pitch when locating in or away. Tee Work - On deck batters hit wiffle balls into the backstop/fence. Ideally there is room at your field outside the backstop/fence. In some urban settings this is not possible. If the tees must be placed inside the perimeter fence of the field, do so as far away from the live batter as possible. You will need to have an adult wearing a glove who stands between the live batter and the players working on the tees in order to protect them from balls off the live bat. Please watch the very short video below ('Josh Hamilton Working off a Tee') with your child. You do not need to watch the entire video. In fact watching it for just 20-30 seconds is enough. The objective is for your child to see a Major League All-Star player, Josh Hamilton, batting off a Tee. Through the watching of this video your child will become educated on the fact that using a Tee is part of ‘practicing batting’ throughout one’s playing career. After watching this VIDEO your child and the players on your team will be motivated to work on their swing using the Tee, because they will then understand that ‘even the pros practice using a Tee’. His torso and shoulders are relaxed through the entire swing. The movement in his torso and shoulders is a result of his lower body turning and his hands/bat accelerating through contact. He is not using his torso and shoulders to swing the bat. A very common flaw in youth batters is initiating their swing with their shoulders (this problem persists up to the High School level and is found in struggling college players as well). The first fundamental action in the swing is “Switching Heels”. All batters, when initiating their swing drive their front heel back and down. While this takes place their back foot turns resulting in the back heel coming up off the ground. The result of these combined actions is energy from the legs pressing against the hip girdle, forcing them to rotate. Many of us have heard the phrase “turn the hips” in relation to the batting swing. The fact is the action of ‘turning the hips’ begins with this action of the heels. When watching accomplished batters we can see this action pretty clearly. There are a few batters where it may be difficult to see this action in the front foot/heel. If you were to take a closer look at those batters (you do not need to invest the time to do so) you would come to recognize that they are driving the muscles of the front leg against the front of the hip girdle. Finally there are batters who stride prior to starting their swing (you may be surprised to learn that most accomplished batters DO NOT stride…that is a subject for another discussion). Many of these ‘striders’, while setting down their front foot, execute the ‘heel back and down’ action. The point to recognize is that at the conclusion of their stride their front foot is in the same position as we are teaching the kids in the batting clinic. OK, enough of the gobbledigook…the videos below clearly illustrate the “Switch Heels” action taught on Day 1. This will be repeated in our instruction on each day throughout the clinic. “Switching Heels”, again, is one of the most fundamental actions in the swing …for ALL successful batters. Note that Mr. Pujols has little or no stride; and minimal upper body movement until after the conclusion of the turn of his legs. Example of a soldier using the same technique as Pujols and Zunino to turn his legs. This video is included to point out that what we are teaching isn’t some ‘secret’ action exclusive to the baseball/softball swing. We want the coaches and players to gain an awareness of how the human body moves to initiate the action of the swing and most efficiently generates power in the swing. The soldier, Albert and Mike are each using the same technique to turn their lower body as effectively as possible …they “Switch Heels”. …only need to watch the first 10 seconds of the video. The base runner(s) is positioned 25'-30' beyond the regular base so they are working behind the infielders who are playing balls off the bat. Note: after reacting to a batted ball, allow the base runner a couple of pitches to return to the base to react to the next batted ball. If each player can react to three balls per session, its been a good day for 'reading balls off the bat'. "Ready Position" EACH pitch: reacting to, and playing, each ball off the bat as if it’s “The 6th inning of the Championship Game”. This means no 'waving' at balls hit a few feet to their side. This means that when a fielder bobbles a ball they recover the ball and finish the play by throwing to first. If they have to dive to stop a ball, they dive. We want an absolute 'game' mindset from the kids on defense. Have an adult at first base to take throws from the infielders after they field a ball (occasionally the adult can be at second base to take throws) If a kid is playing the first base position, they play a bit further off the line than normal and when fielding balls they throw to the adult at the bag and work on their underhand toss technique. If no adult is available to catch throws, still have the kids go through their throwing footwork after fielding the ball). NEVER have a kid catching throws at a base during BP. Soon they are not paying attention to balls coming off the bat and are in danger of getting seriously injured. When an infielder gets a line drive or pop up, they still throw to the adult at the base - take advantage of every opportunity to work on throwing skills. After fielding and throwing, that particular player will be out of position for the next pitch to the batter. That player keeps an eye on the batter while returning to their position. They do not play a batted ball while returning to their position. We want kids playing balls as if its a game....from a position, not while jogging across the diamond. Note: No shagging by players - ever. Use 'parent helpers', siblings, etc. to shag. If the ball is not playable, let it go and prepare for the next pitch. The players need to spend every possible moment working on developing their skills. Shagging is a terrible waste of valuable time for a player. As the defensive group rotates out to the right field Skills Station they can pick up stray balls along the way. Have a coach at first or second base taking throws from infielders. Note: Put players in positions where the batter is most likely to hit the ball. Positions are adjusted for each new batter. Also be sure kids switch up with each other and play more than one spot each day. Whiffle Ball Batting: Two kids batting, one chasing balls; eight swings each, then rotate other kid(s) in. Pitchers: Working with a coach (if a second coach is available to work this station). Work with one pitcher for 3-4 minutes (this allows for 20-25 pitches). Then work with another pitcher. Note: An option is to have a batter stand in while the pitcher is working. This gives the pitcher and batter ‘game like’ experience. Keep in mind that at some point a batter will get hit. Take this fact (and the batter's safety) into consideration when determining to have a batter stand in. Catchers: Instead of working with a second pitcher working with a catcher is an option: Receiving, Blocking, Throwing, Recovering balls in front of the plate, etc. Note: When setting up groups, put the pitchers that need work in different groups since not every player at the side station will have an opportunity to work with the extra coach. Also consider your catcher(s) when setting up your groups, so they can get work at the skills station. Another option at the Skills Station is to have a pitcher throw to a catcher, therefore getting two kids specialized work at the same time.